On Wednesday, April 25, 2018 three new enhancements will be launched in ICOTS. One enhancement adds completely new functionality to ICOTS, while the other two provide an improved user experience. This is the sixth of several enhancement releases to take place during FY 2018. 1.) Add a “tolled” function to the supervision end date to mark supervision end date on hold while Violations are pending - Currently, when a compact case is tolling, the sending state has to change the supervision end date to some date in the future, and then adjust it again when the violations are no longer pending. 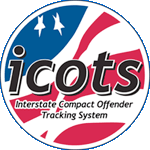 This enhancement now allows a case to be placed in "Tolling" status by the sending state. While tolling, a case will not generate overdue case closure notices if the supervision end date comes and goes. 2.) Display workflow comments in activity history - Currently all comments added during the workflow process to inform users in the compact workflow of certain information are only visible for the user to which they are sent, and then don't show anywhere else after the compact activity is assigned or replied to. This enhancement displays all comments entered in the compact workflow to the activity history on the offender profile. This change is also retroactive, meaning all workflow comments from previous compact activities will also be displayed, not just those entered after this release. 3.) Label case notes generated by reassignment to distinguish them from other case notes - Currently users cannot distinguish different types of case notes just by glancing at the activity history on the offender profile. This enhancement clearly notes all case notes involving the reassignment of a compact case. All other case notes are those manually entered by one of the assigned users on the case.